Hopefully, the recent trend of remaking every somewhat popular horror movie from the 80s has runs its course (but I highly doubt it). The originals are so iconic and timeless that any attempt at a remake or "reboot" is doomed to fail under its own pressure to recapture its past glory. 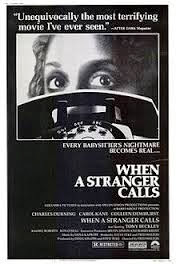 But for some movies like "When a Stranger Calls (1979)" a remake is just what it needs, but would anybody go an see it? The original film has a few memorable lines and a great opening twenty minutes, but after that, it falls completely flat into a boring, drawn-out mess. So this new remake does the most logical thing. Just take that great twenty-minute opening and stretch it out into an 87-minute feature, update it for today's generation and market it to teen girls. Camilla Belle stars as Jill Johnson, a teenager who is being grounded for going way over her cell phone minutes and now must babysit to pay off the bill. She gets a job at a wealthy Doctors mansion way out in the middle of nowhere. He has an indoor aviary (birds) and koi pond for cryin' out loud. So she is left to watch two children who are asleep in an upstairs bedroom. The life in maid Rosa is also around somewhere. Jill roams the halls of the ultra-modern estate when the phone rings. Nobody is there. It rings a few more times, a man breathes and hangs up. The man then calls and asks her if she has checked the children, one of the infamous lines from the first film. Although here its only used as a call back to the original film. After chasing some noises and shadows Jill is freaked out and calls the police, but they can't do anything unless he threatens her, then they can trace the call. During another call, Jill asks the man what do you want? "Your Blood, all over me" Ahhh, creeper! She also finds out that he can see her. Eventually, a trace is done and the policeman calls back with some shocking news. One of the best scary lines of all time. "The calls are coming from inside the house". Needless to say Jill sort of loses her mind, but being the good babysitter she goes upstairs to save the kids. Jill and the crazy man have a brief battle, and we find out what happened to Rosa. Then the cops arrive leaving Jill with a case of crazy-itis. The remake is a whole lot better than the original but as I mentioned before that's not really saying much. Camilla Belle is a good looking actor, but just doesn't seem right for this role, she is more suited to dramas than horror. Carol King played the original Jill Johnson as was alright in the little time she was on screen. Maybe the third time would be the charm, who wants another remake?